Bring the colors of the ocean and the beach into your bath. Sea Glass Soaps are made from natural vegetable glycerin & 100% natural essential oils to enrich your bath experience. Breathe in and inhale the refreshing scents of natural essential oils of Lavender, Peppermint and Eucalyptus & Bergamot. The perfect scent for Mermaids or Mermen everywhere. Each piece of our Sea Glass Soap has been hand cut and shaped adding to the uniqueness of it’s shape. Glycerin soap is gentle thereby making it a good choice for dry or sensitive skin. It also has a lower pH than other soaps, which helps the skin retain its natural moisture. Our glycerin is made from vegetable oils making this a Vegan product. Use like any other soap. Mix with water and work gently into lather. Apply on face or body. Glycerin soap should be kept on a soap dish with good drainage to keep from melting. Can be used as a hand soap in your soap dish or in bath or shower. Natural jute drawstring bag filled with 4 oz. 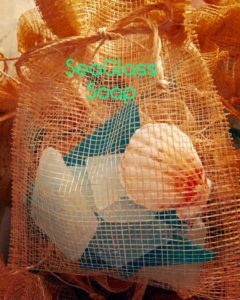 of Sea Glass Soap. Seashell and Lots of Love! All natural, free from SLS, Parabens or any harsh chemicals. Glycerin Soap derived from Vegetable Oils, 100% Natural Essential Oils of Lavender, Peppermint, Eucalyptus & Bergamot. Natural Mica colors.